Wales’ first feminist scorecard is to be launched today Saturday 13 April 2019 at the Welsh Labour conference in Llandudno. 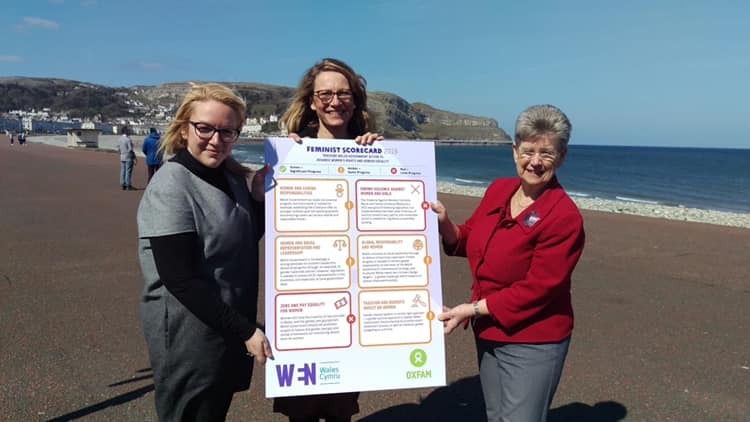 Published by the Women’s Equality Network (WEN) Wales and Oxfam Cymru, Feminist Scorecard 2019 covers 6 key policy areas and charts Welsh Government’s progress towards achieving equality for women and girls. The report follows the announcement in 2018 of the Welsh Labour Party’s intention of leading a feminist government in Wales. The Welsh Government’s Gender Review is addressing a diverse range of policy areas and is a welcome step towards advancing equality for women and girls in Wales. Catherine Fookes, Director of WEN Wales said, ‘We are pleased to launch our Feminist Scorecard which shows that Welsh Government has made some strides to becoming a feminist government and nation.For example, we are pleased to see that Wales now has as a gender balanced cabinet, and we have strong equalities legislation in place. Rachel Cable, Head of Oxfam Cymru, gave room for cautious optimism, ‘Welsh Government has shown excellent intention, but now we need action. The scorecard is a snapshot in time, and a marker in the sand to move forward from. Women are disproportionately affected by poverty and consistently over-represented in low- paid, part-time, insecure and temporary work.